Garage doors in Kentwood, MI | Bouma Bros. Sales and Service Inc.
Who Are Bouma Bros. Sales and Services Inc? When you are working with Bouma Bros. Sales and Services Inc. you can expect a few things. You can expect that we will provide you with quality work and that we can help with your garage door installation or repair. We are a family-owned and operated business and we have been serving the community since 1956. Our technicians are ready to help you right now, so call 616-452-4704 today. When you walk or drive around Kentwood, you will note the diversity of the architecture in the different areas. Some have modern designs, while others are Victorian or Georgian in style. Naturally, you want to have a garage door that will fit your style perfectly. Fortunately, we have something for everyone. Be sure to check out our image gallery to get a closer look at what we can offer. With a population over than 50,000 residents, the city of Kentwood is a pretty good suburb of Grand Rapids to raise a family, find a job and find activities to do. Kentwood is also pact full of diversity and culture. It is easy to commute to various locations, with easy access to the highways, main roads, and basic needs. Garage doors are our specialty, and we carry the replacement parts needed for making repairs, as well as décor that can help to make your door truly your own. Whether you have broken springs, need a panel replaced, need garage door openers and anything else, we can help. Getting an insulated garage door can keep your home safe from the elements no matter the time of year. A quality Garaga door that’s insulated is a great choice. The Standard+ and the Cambridge offer R-16 thermal resistance, which should provide you with the energy efficiency that you want. Craftsman and Ranch/Rambler-style homes make up most of the Midwest. The Standard+ and the Acadia Series are the perfect match to these home-styles. 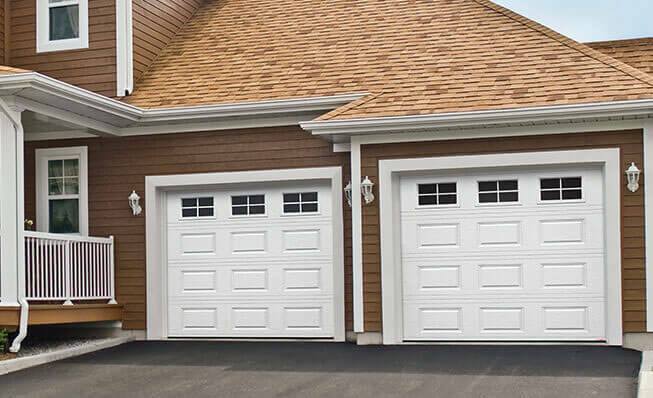 Whether you’re trying to achieve an upscale look with a modern craftsman appeal with a steel carriage house door, we offer a comprehensive selection of services for a wide variety of residential garage doors. LiftMaster garage door openers are a great solution for your garage door system. They are reliable and easy to use. We can provide you with openers for residences, commercial spaces, and even industrial garage doors.